Rigid boxes-also called as set up boxes, offer business the ability to present products both safely and beautifully.These custom made rigid boxes are designed for meeting custom specification based on the marketing and branding requirement of products,Rigid boxes are best packaging choice for cosmetic,liquor,confectionary,boutique,entertainment,consumer products,multimedia,gift card and more.Those beautiful,unique,creative,distinctive rigid boxes can connect with and inspire your clients,,a tremendous selections of luxurious fine paper and fine printing as well as stunning finishes process such as hot stamping,embossing,uv spot varnish can create the desired look and feel.As gift boxes manufacturer,Shopping Bags Mart specialize in manufacturing rigid boxes coming in wide variety of styles,sizes,shapes to fit any occasion. Rigid boxes are considered as high end packaging solution for any product and gift item.The advantage of rigid boxes is that rigid boxes are available in any size,shape and style to fit any end.So rigid boxes offer unique shape,elegant looking,luxurious feeling,great for high value products.At Shopping Bags Mart,rigid boxes have so many variety of style,options include tray,partial cover,angled neck boxes,hinged neck boxes,neck boxes with die cut insert,neck boxes,shoulder boxes,hinged lid boxes,lift off lid boxes,clamshell box,3 sided hinged cover boxes,book styles boxes,tray with sleeve,drawer boxes,slipcase,slipcase with divider,slip case and more. Lift off lid boxes: That have different styles too,including full cover lid,half cover lid,part cover lid,neck cover lid,shoulder cover lid that can fit any demand at luxurious packaging. Neck Boxes: Neck boxes are three piece specialty boxes where the lid and bottom do not telescope,or overlap. Bottom and lid kiss together or never touch each other.The inner neck,which can be a set up tray,a glued sleeve, or platform, is glued or friction-locked into the bottom of the box.The inner neck's function is to guide and hold the lid in place when this box is closed,great for high value products. Hinged lid can enhance the value of a product.It also create extra impact when there is s special message to be presented,great as high end packaging for cosmetic,skin care,high-tech products,sale kits. Hinges may be paper,metal,stitched or taped.As gift boxes manufacturer,Shopping Bags Mart specialize in hinged lid rigid boxes coming in any size,color,finish at great cheap price. Paper Hinge:the most common hinge on a hinged box is achieved by adhering the lid paper the bottom of the box.Most often,this style of hinge is used when the cover of box extends all the way down,or is full telescoping.Great for medical Devices,bio-tech,and stationary products. Taped and Stitched Hinge: our strong hinge for boxes is called a taped and stitched hinge.This style is made by stapling the cover to the bottom,then adding a piece of paper or tape to cover the staples.You can add a taped and stitched hinge to a box that has a short lid or a full telescoping lid. Three-Side Cover Hinged Lid: another hinged for specialty box is called a three-sided cover hinged.Great for wine,beverages,oils and spirits. Slipcase are strong,high quality,and labor friendly package.Slipcase are strong enough to protect your product.From magazines to audio cassettes,from books to DVDs,all have been safely packaged in slipcase.Strong slipcase also add aftermarket value to your product.When you add your business logo and information to your slipcase,you are creating a promotional tool. Because of your slipcase's strength and durability.Your customer will display your slipcase on their shelves for lasting long time.As gift boxes manufacturer,Shopping Bags Mart specialize in manufacturing slipcase coming in any size,color to fit your requirement. Those rigid boxes have the same style as slipcase,usually with ribbon pull,great as luxury packaging solution for small gift items,belt and more.Huge selection of wrap paper,printing and finishes can make unique drawer boxes,tray with sleeve easily for branding and marketing. How to Build Rigid Boxes? How to build rigid boxes to meet your desire,products and promotional campaign? As rigid boxes manufacturer,Shopping Bags Mart offer huge selections of wrap paper,printing,finishes process that can help you to create right rigid boxes. Paper Board & Wrap Paper: We use quality paper board,kraft paper board,recycled kraft board to build rigid boxes that can ensure every box is very sturdy and strong to protect any product,present the business quality. If paper board is the skeleton of rigid box,then wrap paper is the skin. Paper choices at Shopping Bags Mart are endless to offer different looking and feeling.Such as art paper,kraft paper,white kraft paper,recycled kraft paper,foil paper,special paper are perfect as wrap paper to cover paper board, and build your rigid boxes. Printing For Rigid Boxes: printing can make or break your rigid boxes.Add a simple,one color line art logo or a vibrant full color photographic image to your box.Shopping Bags Mart offer offset printing,foil stamping,embossing,uv spot varnish for your rigid box,inside and out.Plus varnish,coating and film lamination can be added if needed.With printing, your rigid boxes are not only as boxes,but as long lasting billboard to advertise your business. Offset Printing: You can add any color on your rigid boxes,whether it is one or two color logo,or solid color pantone color to match, or full color for photographic image. Hot Stamping | Foil Stamping: Great way to highlight business logo.You can add a look of distinctive to your rigid box by hot stamping.With hot stamping,you can achieve a brilliance that can not be duplicated with ink.A wide foil colors are available including matt,metallic or hologram. Embossing: Through embossing,We can add texture by raising your logo off your box, that can offer not only impacted logo,but luxurious feeling to add more value to products and business brand.Embossing is usually used together with hot stamping to get the best effect. Shopping Bags Mart offer rigid boxes,set up boxes,neck boxs,shoulder boxes,clamshell boxes,drawer boxes,pop up gift boxes,gable gift boxes at great wholesale price. When you are looking for some gift boxes with eco friendly and green looking,kraft gift boxes are perfect choice.Because kraft gift boxes are 100% recyclable and biodegradable. Kraft gift boxes are made of kraft card paper,or recycled kraft paper board covered by kraft paper,coming in different styles such as folding kraft gift boxes,rigid kraft gift boxes,foldable kraft rigid boxes, kraft gift boxes have green and natural looking,great as eco friendly gift boxes,apparel boxes,shoe boxes,jewelry boxes,wine boxes,candle boxes,cosmetic boxes. Magnetic Boxes With Printed Logo from Shopping Bags Mart. 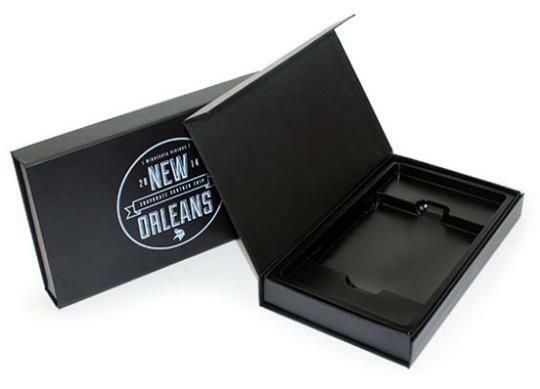 This rigid set up box, it is made of heavy duty paper board,covered by art paper with matt lamination,one color printing with reversed logo on top lid,hinged lid with magnetic closure,custom die cut paper insert.